Every one of us has felt at some point like the disciples did when Jesus Christ found them washing their nets. They had fished all night and caught nothing. Things had not turned out as they had hoped, and they were disappointed, frustrated, and had already given up. But when the Lord told them to get back to work and let down their net just one more time, they did so and caught so many fish that their net began to break and their boats began to sink. What a great surprise that was to them. They were all amazed and St. Peter fell down before Christ and said, “Depart from me, for I am a sinful man, O Lord!” But the Lord replied, “Do not be afraid. From now on you will catch men.” Then the disciples left behind their boats and nets and followed Christ. That day probably began like any other day for them. They were busy with their work and who knows whether they expected anything out of the ordinary to occur. It was just another day with the same old routine and the same responsibilities and worries. But when they obeyed the Lord’s command, He blessed them and challenged them to see that their lives were not simply about catching fish, but about bringing people into the eternal life of the Kingdom of God. They heard that day a calling worth leaving everything else behind. Fishermen are famous for exaggerating and telling stories about the size of their catch and the big ones that got away. But these fishermen knew that their skill and luck had nothing to do with taking in such a large haul of fish. They had not been so successful because of their abilities, for their best efforts all night long had produced nothing. But as St. Paul wrote to the Corinthians, “now is the acceptable time…now is the day of salvation.” In other words, Christ called and enabled them to receive a blessing beyond their wildest dreams on that particular day. That was not, of course, simply for the sake of success in catching fish. Instead, it was a sign that they would become fishers of men. The Savior blessed and enabled them for a new life, a new ministry which transformed and fulfilled the toil of their daily lives. He called them to something completely different from what they had known, and they were greatly surprised. Like those fishermen, we are just flesh and blood, created from the dust of the earth by the enlivening breath of God. In the world as we know it, we are subject to death and decay and cannot even control our own thoughts and actions very well. 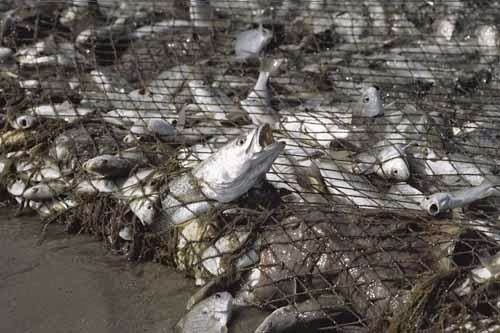 We cannot make fish swim into our nets or bite our hooks, much less can we give anyone eternal life. And no matter what we do all day, we encounter much that is well beyond our control. The good news of the gospel, however, is that our Lord is able to bless and transform our daily work, the difficult situations we face, and all our struggles in ways that bring us more fully into eternal life. Our salvation is not a matter of escaping our bodies, this world, or even our problems. Instead, it is a matter of their fulfillment in the God-Man Jesus Christ, the Second Adam Who heals every dimension of our existence. No matter what we are doing or experiencing, no matter how well or poorly it may be going, Christ is with us, inviting us to make the same old frustrating and boring routine into a ministry of the Kingdom, an icon of the salvation of the world. The Lord created every dimension of our life and every bit of the universe. He calls us and it to become holy. No matter our circumstances, He calls each of us to offer our lives, including our frustrations and failures, to Him for healing and fulfillment. Just as He used a failed night of fishing for the salvation of the world, He wants to use us for His glory in ways that we cannot predict or fully understand. Though it is beyond our spiritual or rational comprehension, a central teaching of our faith is that Jesus Christ is present to us in every human being whom we encounter every day, for we all bear His image and likeness. He spoke the universe into existence, so we are always on holy ground. He calls every human being and the entire creation to shine with the light of His glory. In all that we do, no matter what it is, we are to offer the world back to God for His blessing. In this sense, we are all the priests of our own lives. In our daily struggles, He calls us all to become iconographers who bring out the beauty of the world and all its inhabitants so that we all manifest more fully the life of our Lord, so that the whole creation becomes more fully an icon of His Kingdom. In order for us to accept this high calling, we must learn from St. Paul how to work every day as priests and iconographers of the creation. Like him, we need to show patience in our sufferings and problems. We must use even the difficult, frustrating, or simply boring parts of our lives as opportunities to grow in faith, hope, and love. It is tempting to think how nice life would be if we always got our way on our own terms and time table. But if that were the case, we would never get over our self-centeredness and impatience. We would never sympathize with others who were not so successful. We would have little chance of becoming fishers of men if we easily caught everything that we pursued purely by our own ability. We would probably become so addicted to our own success that we would never leave behind our nets and follow Christ. Of course, no one’s life is really a simple story of going from one success to another. As we all know in various ways, life is often so difficult that it takes effort to resist the temptation to despair, to simply abandon all hope of experiencing God’s presence and blessing in our lives. It is so tempting to focus on our failures, limitations, and distractions. That is why we must embrace prayer, fasting, repentance, and other spiritual disciplines in order to gain the spiritual strength to persevere, to continue the journey of taking up our cross and following Him. No matter how hard life is, God’s salvation is not reserved for some other time and place. “Now is the acceptable time…now is the day of salvation.” If we do not hear and respond to His calling today, right now in our present circumstances, then when will we? If we wait for everything to become perfect according to our own preferences, we will never obey Christ and play our unique roles in the salvation of the world. That was true for those first disciples and it is still true of us. Despite their disappointment, they had to let their nets down one more time, even though they probably did not really believe that the results would be any different from those of the previous night. But St. Peter had enough faith at least to obey Christ’s command and to try one more time. And that is when their lives changed forever. The next time that we are tempted to think that there is no hope for us in participating more fully and faithfully in the life of Christ, let us at least have as much faith as those fishermen who let down their nets one more time. That is how they became fishers of men, great apostles and evangelists who offered their lives to the Lord and became instruments of the salvation of the world. By God’s grace, may the same be true of us as we refuse to be distracted from hearing and obeying His call each day of our lives.